Es nunquam sola est, nos culmus invicem. Forgotten due too excessive alcohol consumption. At about same time as the city of Godville. The Heroes Alliance is one of Godvilles oldest Guilds. The name is believed to be the best the founders could agree about or the most creative they could think of. This is a question that still to this day is unclear. Much of the guild's early history is unclear, as some historians believe is due to the early members were illiterate, could not remember anything because out of repeated blows to the head, but most of them are convinced that the idea of ​​having a open fireplace in the archive is the cause. If the hero has completed their temple and/or have managed to get their pets level 30, the medals will be there too. Pets gets collars in the same color and medals if the hero has them. Finally it should be mentioned that the prophets are often called the big cheeses. This is due to a shopping list that ended up in the wrong place and the very complicated system of naming different titles in Godville. Here we list the pets that their former owners miss and always will remember. 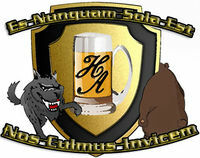 There are multiple guilds who would argue that their early members invented beer, something which may be due to the Gods affecting the archaeologists in Godville, but the Heroes Alliance Guild has in their archive historical documents concerning a certian Charlie Mopps. Much of his early life has been lost because of the vast archive fire that took place at some point after the Arena's completion. A few early members, whose names are also lost, are suspected to have thought it was a good idea to have an open fire inside the archive. But what we do know is that Charlie joined the Heroes Alliance sometime before the Arena's construction was started and that he already was known for not being the best hero. Historians believe that his god, whose name is lost because of a spot of hot sauce, ; heroes of the same level. Anyway, Charlie became a very popular member, not for his heroic efforts around Godville, but because he had an ability to create the most delicious dishes. This ability was the reason he decided to stay and serve as the Guild chef, giving him more time to focus on his culinary and alchemy experiments. This experimenting was later moved to a shed in the yard, which though some historians say is because he was a bit paranoid and others believe that the experiments smelled very bad, most agree that the explosion in the kitchen which injured multiple members is the main thing. Many members were very positive about these experiments, especially after he moved out to the shed. They even provided him with various substances and materials they found during their quests. The historical texts tell us that nearly all experiments were not really as successful as Charlie had hoped for, with the exception of the experiment that gave us beer. What exactly happened is, like much else, not very clear, but this we can say with certainty: a large explosion occurred sometime in the middle of the day (what day, what year do we know not), which was an almost everyday occurrence at the time. When the heroes who were on CX-duty (Charlie explosion) came up to the crater (the explosion is said to be almost as big as the one that destroyed the kitchen), Charlie and the shed (which often had to be built up again) were gone and the crater was filled with a yellow/light brown liquid. After a couple of hours searching, Charlie was found hanging on the South Tower's flagpole. After a quick stop at Guild doctor, Charlie began to investigate the mysterious fluid, going through his notes regarding the unusual mineral which he experimented with up to the explosion. The liquid resembled a mixture of malt, hops, yeast and water, and he named it beer. A couple of days later, he observed that the crater was still full even though most members had been drinking from it continuously, and resulted in the historically first medical diagnosis of hangover. He concluded that the unusual mineral, which still lay on the bottom of the crater, somehow recreated the liquid in a stable pace. The mineral was named beertonium. After that he began his most ambitious project to date, Charlie took the Golden Bricks he had accumulated from his since long abandoned Temple building and created (after many days of hard work) the Guild's most prized relic: the Golden beer fountain! A treasure in solid gold which to this day is used under controlled conditions. After this the recipe of beer spread, resulting in different tastes and flavors of beer popping up quickly and Godville has been drunk ever since. A while after beer had become the most common beverage in the known world, Charlie decided to find the location from where the beetonium came from. Of course no one knew where it was, bad memory has always been been a part in being a hero in Godville, so he decided to find the location himself. The last time Charlie Mopps was seen when he proudly marched out of the capital. What happened after is only speculation. Some say that he was murdered by some of the larger beer manufacturers, others say he was eaten by some of Godville's Monsters, starved to Death in the wild, that some gods erase him from existence for having made their heroes alcoholics, and a few believe that he actually managed to find more beertonium and continued his experiments until he died. We'll probably never know what happened, but whatever it was, Charlie Mopps is one of the guilds most celebrated members through time. In the garden stands a massive golden fountain that produces delicious cold beer. Under an agreement with the taverns and the major beer manufacturers the beer of the fountain can only be used by the members on special occasions like welcoming of new members, rank upgrades of members, completions of members temple and the death of a member or their pet. Bathing and laundering of the fountain is strictly prohibited. To keep morale high and to try to reduce alcohol intake by members, the guild have created a few exclusive competitions which all members can participate in if they want. The rules are simple, the current Comment of the Month(CotM), determine a theme or say anything(around the end of the month) and those who want to attend then comment on. The CotM choose the comment he/she/it sees as the best comment. The announcement of the best comment is made ​​on the second to last day of the month(because of different time zones, it is the current CotM's time that will apply). The winner gets the epic non-existential Best Comment of the Month solid gold trophy, bragging rights and a one-hour free access to the gold fountain. Then it starts all over again. 29/6/2013 GamerMind 庙舟畜 Plutonium eggs and bacon. Part of a nutritious and healthy breakfast that contains all the vitamins and minerals a growing hero/heroine needs. *Original comment is missing due out of administration errors. The Comment of the month award is temporarily closed down due to out of administration errors.